First created to store tobacco, the trading cards inserted into packs of spagnolette (a name for cigarettes in the 19th century, a name traditionally carried forth at regional level well into the 20th century) became sought after collector’s items and unique advertising tools in the 1900s. The cigarettes were initially sold in bulk by weight, and then were packaged in paper packs, which would crumple when used. To prevent this from happening, a card was inserted into the pack, and towards the end of the 1800s eye-catching images were printed on the cards to promote the product, a practice that had been in use for decades for other types of products (the idea to use the cards for advertising products was first introduced in France in the mid-19th century). Soon these advertising cards were printed in theme-based series, becoming sought after collector’s items for both the young and old, inspiring the cigarette companies to design albums that were offered upon presentation of a certain number of cards. After having conquered a top spot in the American market, British and German producers also began to publish series of trading cards dedicated to famous people, animals, war-related events, propaganda slogans, to name just a few. Since cigarette packs in Italy had for a long time contained the trading cards from various companies, Anonima Infortuni (a subsidiary of Generali founded in 1896) decided to implement this advertising system in a limited experimental campaign in the city of Bologna. Therefore, in the early months of 1911, packs of Macedonia cigarettes were sold with advertising cards (numbered 1001-16000) with the portraits of three Italian aviators: Bartolomeo Cattaneo, Umberto Cagno and Umberto Savoia. As described on the back of the trading cards, the promotion included a 10% discount on the first year of an accident policy, applicable to anyone who brought one of the numbered cards into an agency branch. 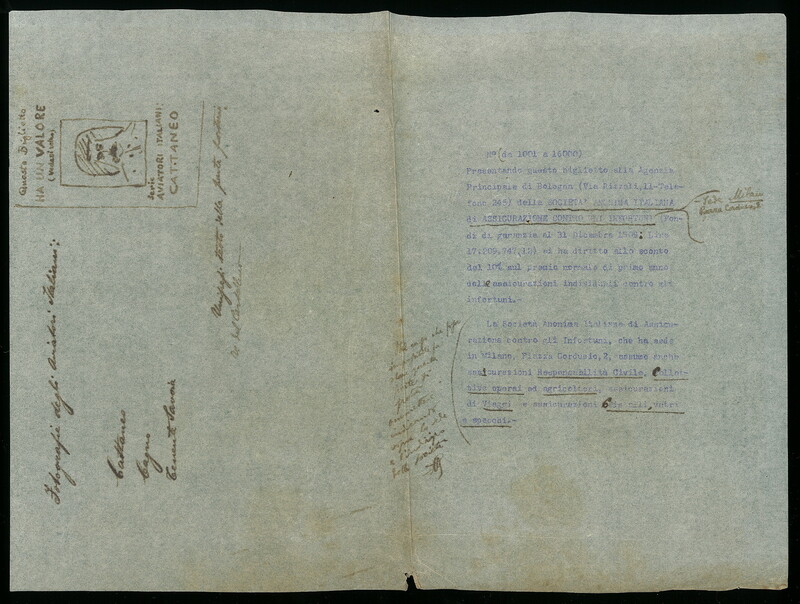 The advertising system did not provide the expected results, however, according to the information available in the relative file stored in the Generali Historical Archive, with a record of the correspondence between the main Anonima Infortuni agency in Bologna and the parent company, the agreements with the company assigned to the distribution of the trading cards, as well as related sketches and some advertising samples from other companies. 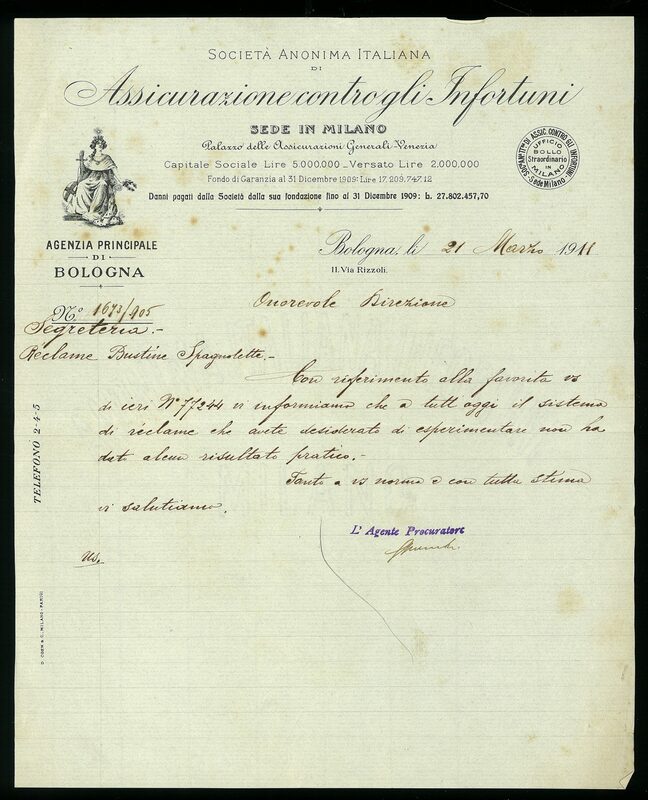 In fact, the file is interrupted in the spring of the same year with a laconic reply from the Bolognese agent, “as of today the experimental advertising campaign that you wanted to implement has not provided any practical results”, when pressed by his superiors for information. During the two world wars, the production of trading cards slowed down due to a paper shortage, even though several series were produced as propaganda tools to support the war effort. Even though their production was on the increase in the period between the two world wars, after the conclusion of World War II the trading cards were no longer distributed.